Years ago, I was introduced to the concept of being intentional about bedding. Sure, I had coordinating shams and comforter, but how intentional is a bed-in-a-bag? I mean, does that really provide a quality nights sleep, or a place that you look forward to falling into night after night, or give you that “I don’t want to leave this” feeling? Splurging on high quality sheeting was so frivolous…so expensive…so unnecessary. Later, coincidentally, I worked in a luxury linens boutique for several years and learned even more about the elements to the perfect bed. The quality and composition of the foundations, the linens, and even the accessories all add to the overall sleep experience. It is indeed an experience…it’s tactile… it’s emotional…it’s completely sensory. We spend 1/3 of our lifetimes sleeping. Lack of, or even unsatisfying, sleep has been known to cause a multitude of illnesses, mental issues, and relational problems. Why not pay closer attention to the environment of sleep—specifically what we choose to sleep in and on? 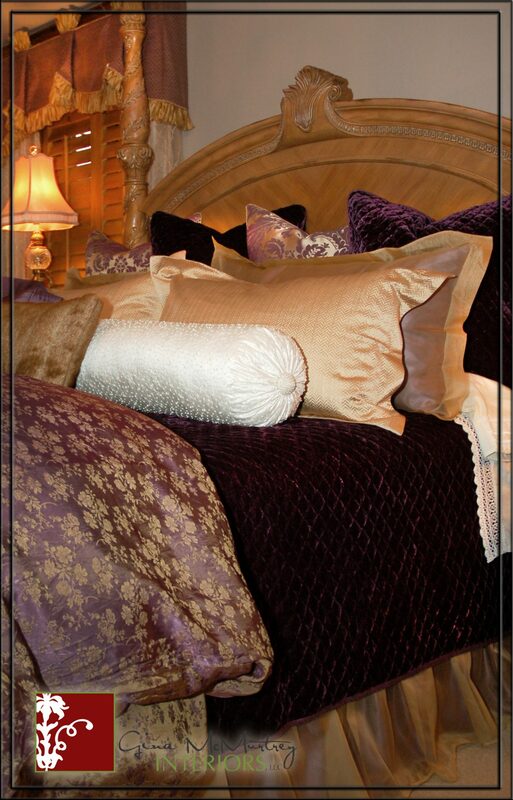 The next few articles will break down the essential elements of a luxurious, well-dressed bed. Like most things, there is quite a range in quality and price of each of the elements. You could spend $50 for a king-sized Egyptian cotton sheet set from a big-box store, or you could spend $500 for a similar set from a luxury linens manufacturer. Yes, there are differences—it’s not just a label game. The whole bed (not including the mattresses) can cost around $300 for low-end products to over $5,000 (easily!) for the true, luxury bedding ensemble. Take the information and make it yours and in your budget. Start with sheeting. Buy the best you can afford or even slightly above. They will last longer, feel better and you are worth it…but more on that later. • Interested in a kitchen renovation? Contact me today for an in-home consultation! previous post: Spice up your room with these hot new rugs for 2013!